Imagine being able to pinpoint someone's location anywhere in the world simply by typing a few keywords on your PC. That is what software partly funded by the US military is trying to do. The MetaCarta program works by analysing thousands of documents and cross-checking the results with a massive geographical database. So far it has largely been used by US intelligence agencies to analyse the huge amount of information collected as part of the war on terror. "The government and international security agencies have a desire to find, track and sometimes arrest people," said Randy Ridley, MetaCarta's Vice President of Sales. "Our system can be used to find them across the globe." "Perhaps it could be used to find Osama Bin Laden by checking out various aspects of Afghanistan and other parts of the world where we think he might be and see if there is a lot of data that supports a potential presence," he told BBC News Online. The company behind the software was founded in 1999 by researchers from the renowned Massachusetts Institute of Technology. 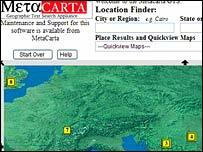 It received funding from the Defense Advanced Research Projects Agency and the investment arm of the CIA to develop its MetaCarta Geographic Text Search program. The software automatically extracts geographic references from text documents such as e-mails or webpages. Millions of documents can be searched using keywords, place names or a time reference. Search results appear as points on a map instead of as a list of documents. The company says this information can be used, for example, to track patterns of criminal activity and identify spots of intensity. The software relies on the reliability of the documents searched. But the program tries to take account of some of these factors by making sure it has found the right location. This can be particularly tricky in the Middle East, where many place names are the same as a person's name. 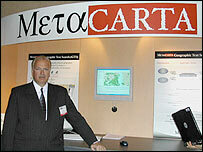 To counter this, the MetaCarta software uses an AI process to make sense of the geographical information, rating the results on a probability factor. The company sees its product as giving the intelligence community an edge in providing timely and reliable analysis of mountains of data. "Government agencies have information archived, streaming in," said Mr Ridley. "We estimate that there is roughly 1,000 to one or 10,000 to one productivity advantage over a human doing it manually, depending on the process." "In three to four years we expect this software to be ubiquitous," he added, "something that everybody has to use to do their work." Since September 11, US security agencies have increasingly turned to technology to help them process website postings, internet chat and e-mail traffic. MetaCarta was exhibiting its technology at the recent Government Convention on Emerging Technologies in Las Vegas, which showcases hi-tech products developed for use in the fight against terror.